Review: I suggest selling it with a small binder that holds the approach and enroute charts that the pilot needs in the tight cockpit space. Then a second binder for the remaining larger general information. Review: Excellent. Worth every penny. Review: Great product, solid construction, doesn't feel like plastic. Pros: Very securely holds the charts in place. Review: If you can find a substitute and don't care about having the Jeppesen name, then do it. Otherwise this will get the job done for a few extra dollars. I wish I paid for the premium leather binder as it is more flexable and easier to hold on to. Review: This is a great binder to protect and keep your approach plates organized. Even though its plastic its made very well and its sturdy. 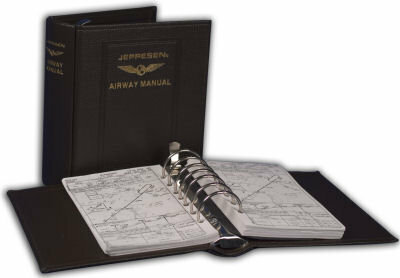 If you want a Jeppesen binder this one is reasonably priced and should last for a while. The only thing is the big rings create an indentation against the inside of the front and back cover, very minor wear after awhile. Cons: No easy way to hold onto enroute charts and is very stiff. Cons: big rings create an indentation against the inside of the front and back cover, very minor wear after awhile. A: The binder is 9" by 7.75".